In an effort to review India’s emergent move into global economic dominance I thought that it might be useful to look at a few of Gandhi’s ideas of something called ‘political culture’ through the eyes of Pandit Jawaharlal Nehru. And indeed, Gandhi and Nehru did not have a monopoly over ideas to craft a new political culture. But we have to start somewhere. I present these ideas randomly, not for integrative purposes. Nehru noted too the cultural impact on India of a Turkish invasion, an Afghan invasion, and a Turco-Mongol or Mughal invasion; and highlighted ‘purdah’ (seclusion of women) as one new cultural development, among others; ‘purdah’ possibly emerged during the Mughal times. Isolating women in both public and private life was noticeable in Delhi, the United Provinces, Rajputana, Bihar, and Bengal. Gandhi spoke out against ‘purdah’; through the Indian Congress Party and with the help of thousands of middle-class women, Gandhi advocated that women should have the same freedom and opportunity for self-development as males; and an end to domestic slavery. Note the constitutional provision in Guyana for the Women and Gender Equality Commission; still on paper, as the PNCR withdrew its parliamentary services on the day the item was put to the vote. Guyana is poorer with this loser mentality. For Gandhi, the squalor of poverty and the great divide between the rich and the poor owed their existence to foreign rule and foreign exploitation, and capitalism through introduction of technology; Gandhi was not opposed to technology per se, but believed that it should be applied to absorb labour and not produce new unemployment. To alleviate some poverty, Gandhi devised a programme of the spinning-wheel and village industry to address the problem of India – scarcity of capital and abundance of labour. Gandhi believed that the ends, such as profitability from technology, cannot justify the means, as unemployment to attain prosperity; he understood that moral values must first triumph, as the ends cannot substantiate disreputable means, no matter how good the ends are. But Nehru believed that the real meaning of Gandhi’s teaching was fearlessness and truth with allied action, at all times upholding the welfare of the masses. This was the period of British rule of India, at a time when deep-seated fear stalked the land; fear of British institutions. Gandhi’s voice on truth and fearlessness brought some change and a psychological reaction that enabled people to feel ashamed about their long capitulation to foreign rule; and indeed the desire to do something about it. And this is true, too, of his nationalism, inevitable for the freedom of India. It always has been the norm that a country will first protect its national interests before it considers the international community interests. And Nehru noted that Gandhi’s nationalism deviated from that norm; for the longevity of foreign rule and exploitation in India became an irritant to the mind and distorted all thought and action; producing frustration and bitterness. But Gandhi’s nationalism had a world outlook, where he visualized a world federation of interdependent states; and Gandhi created a nationalist movement that reduced irritation and animosity that Indians felt against the British. 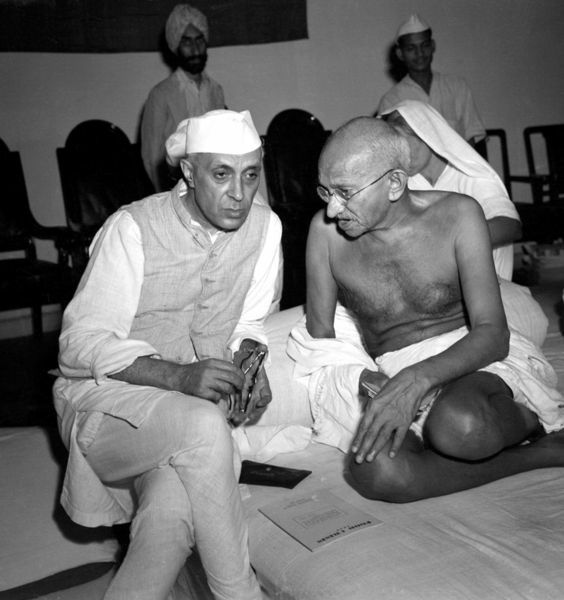 Nehru remarked that he had not seen any other nationalist movement like Gandhi’s, largely devoid of hatred. Incidentally, Dr. Cheddi Jagan also spoke about interdependence between the North and South in his New Global Human Order proposal. Through Nehru’s eyes, we saw how Gandhi’s passion for democracy transformed the Congress Party into a mass movement; becoming an agrarian organisation; how the success of anything was premised on the quantity and quality of benefits the masses receive; a unique and quiet kind of democracy for the masses, definitively linked to the freedom of India. Prem Misir is Pro-Chancellor of the University of Guyana.